Helmets are designed to keep you safe from injury that is why you need to keep your helmet safe as well. 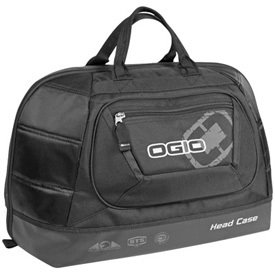 With the Ogio Head Case you will be able to store and pack any helmet with or without a visor. The Head Case also has an extra pocket for your goggles, lens and tearoffs. Ogio designs a rich selection of quality production that sets them apart from other competitors. So with the Ogio Head Case you are not only getting a piece of luggage but you are purchasing a quality made bag that cares about the need of riders. Oversized helmet bag fits all helmet brands/sizes with fins and without. iFOM integrated foam panels and additional fleece interior provides the ultimate protection. Protective zipper teeth closure prevents scratches from zippers. Easy access oversized external sleeve pocket for goggles, lenses and tear-offs. Exterior zippered accessory pocket for valuables. Nice bag. Larger than most on market. It fits my AFX FX-41 Dual Sport helmet just fine. Most bags are a little smaller, and this helmet is a little larger than others, so it works great. Well constructed with quality materials. I bought the wife a helmet and had it custom airbrushed so I wanted something to protect the investment. This bag does it well. Honestly, we will buying more for the rest of the families helmets. It is one of those things we didn't realize we needed until we had it. I purchased two of these bags and I am impressed with the quality and attention to detail. Bag has plenty of room for a par of goggles and gloves as well. solid bag for any lid that does not come with one. Like the zippered pocked for my go pro and the velcro side pocket for tear offs. Great bag for a great price, plenty of room for extras. High quality Ogio product. Plenty of room for helmet with visor and space for gloves, goggles and facemasks.